Multi-media storyteller Yang-May Ooi recounts how she gave up being sensible and fell into the Cult of the Brompton as part of her project to re-connect with nature. I resisted for a long time. I would look longingly at the Bromptons whizzing by as I walked through London. They looked fun and zippy. It was clever, the way they could be so easily folded up into a tiny little package. But they are only for city riding and I did not plan ever to tackle scary London traffic on a bike. I didn’t need a Brompton, a sensible voice in my head told me. I walked everywhere I could, bus hopping or taking the tube or train for longer distances. There are Ubers and other cabs I could take if public transport let me down. If I got a bike, my sensible self told me sternly, it would be a touring one so I could go out into the countryside. Because, as my sensible friends would advise me, those tiny 16 inch wheels can’t be used for touring or off-road riding. And Bromptons are expensive. A touring bike would be cheaper. Especially for what I want to do, which is go on cycle rides outside towns and cities. 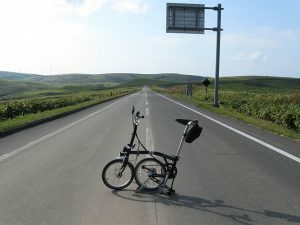 It all made sense, these very good reasons not to get a Brompton. I want to be that guy… or, at least, the 50+ year old female version of a guy like that! Also, the internet is a wonderful thing. 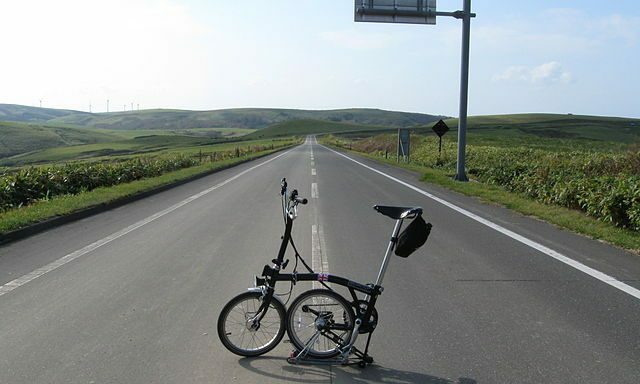 It showed me a ton of blogs and stories about people who had done long distance touring with Bromptons. It’s called bikepacking, apparently, and there’s a sub-category of Brompton-packing. And the way that Brompton riders talk about their bikes has an enthusiasm and love and excitement that is very enticing…! So, very unsensibly as is the way with seduction into a cult, I got myself a black Brompton the other day – and I LOOOOVE IT! OK, I will ‘fess up and admit that at the moment, I haven’t gone anywhere very exciting with it yet – those tiny wheels do take some getting used to and I’m practicing my whizzing around in our local park and quiet suburban streets. ReWilding My Life is a Tiger Spirit project about re-connecting with nature and a more natural way of being, conceived and presented by Yang-May Ooi and produced by TigerSpirit.co.uk.